Liniments have a long historical background in traditional Chinese medicine dating back to triage on the battlefields. Known as Dit da jao or “fall and strike wines”. These herbal wines were closely guarded family recipes, the secret weapons of quick recovery. When properly modified for the equine athlete, these ancient wines help modern horses recover from sprains, strains, tendon injuries and bruising. Liniments are an extract or infusion of herbs, usually in alcohol; hence, the name "wine" in Chinese. From the Chinese medicine perspective, alcohol invigorates the blood and qi and allows for better penetration into an injured area. Liniments are applied topically with the intention of reducing pain, swelling, inflammation and to speed healing. Herbs have very distinct jobs and are categorized by physiological function, taste, temperature and body region influenced. A well-formulated liniment will combine several herbal elements based on these factors. Ideally, a liniment designed for tendon repair will contain homeostatic (stop bleeding), anti-inflammatory (cooling and inflammation reducing), blood stagnation (bruising) and qi moving herbal components. Liniment therapy takes a multi-phased approach. Phase one is to stop any internal bleeding with homeostatic herbs like San qi (Radix pseudoginseng), thus lessening bruising and blood stagnation, which if left unresolved slows healing. The second phase of liniment therapy focuses on cooling tissues and reducing inflammation with cold, descending herbs like Blessed Thistle (Cnicus benedictus compositae) and Da Huang (Rhizoma rhei). Much like an ice pack, cooling herbs reduce inflammation and allow improved blood circulation. 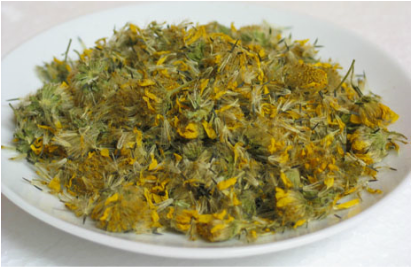 The third phase includes blood-moving herbs like Arnica (Arnicamontana ) and Dang gui wei (Radix Angelicae sinensis). Blood-moving herbs enhance the removal of tissue debris and stimulate microphage activity, allowing flesh blood into the injured area. The result is less inflammation, reduced bruising, scaring and pain and enhanced tendon healing. Liniments are an infusion of one or more herbs, usually in alcohol. It is economical to brew your own and very easy to do. Liniments make thoughtful holiday gifts and have a very long shelf life. Below are a few of my favorite liniment recipes. 4 cups of either rice wine or vodka. Combine herbs in a glass jar, cover with a lid and soak and store in a cool, dark place for at least two weeks. Shake the jar daily. The result will be a rich, dark amber liquid. I like to keep a small spray bottle filled with arnica liniment on hand in my barn for easy applications. Cover with 5 cups of which hazel, rice wine or vodka. Soak for least two weeks. Cover with 8 cups of vodka. Soak for least six weeks. In a large covered glass jar (never use aluminum) add herbs and alcohol. Herbs can be whole but rough chopped is preferred. Herbs can be sealed into a tea bag or tied in a muslin cloth. Seal and store in a cool, dark place away from direct light. Shake periodically. Decant and use as needed -- there is no need to strain out the herbs. Liniments improve with time. Do not store liniments in plastic for extended periods of time. Liniment can always be safely applied alone, or diluted with water. I like to use a spray bottle to avoid spills and waste. Saturate the area and soak the hair well. Liniment can be applied several times per day. Caution: avoid open wounds; some grey or thin skinned horses can develop a skin reaction. Caution with prolonged use under wraps. Rinse with soap and water regularly to prevent sticky build up. Liniments are not for internal consumption.